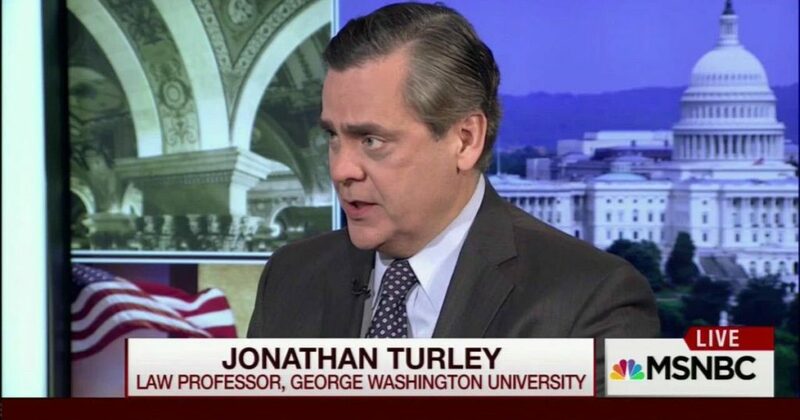 Liberal law professor and constitutional expert, Jonathan Turley, was once a darling of the left. Whenever they needed a legal opinion from the left, they’d rush to Turley to explain why conservatives were wrong… that is until they asked him to help them scapegoat Donald Trump. See, while Turley may be a liberal, he’s an intellectually honest and a legally consistent one. So when he was asked about Trump, he had to admit the truth… Trump hadn’t done anything wrong and there is no legal reason for Mueller to be hounding him. Fox News pundit Sean Hannity recently had Turley on, and the professor reiterated his previous thoughts on the case against Trump… namely, that there is no evidence of any crime having been committed. Which means… there is NO CASE AGAINST TRUMP. Sean Hannity: Former U.S. Attorney Joe diGenova on this program last night eviscerating the deputy Attorney General Rod Rosenstein and Robert Mueller. And the mainstream media, by the way, also deserves blame. Professor, I’ll let you answer your own question. They seem to not want to accept that reality. It’s been, what, over a year we have been looking into this in a lot of varying ways. Jonathan Turley: Yes, there is a troubling pathology in the news where people seem to be unwilling to cover what is positive news for President Trump. There is not positive news as well. But that rather one-sided account is getting increasingly alarming. The fact is that there is not a strong credible case of crime that is emerging from this investigation. After a year, after hundreds of thousands of documents that have been turned over, after multiple cooperating witnesses, after dozens of criminal counts, none of those filings have created a nexus between a criminal act and the president or even the campaign for the most part. Sean Hannity: And collusion, Professor, is not a crime, is it? Jonathan Turley: It’s not. And, you know, we went through months where people were arguing, talking as if there was a collusion crime. But the interesting thing is, look, collusion and obstruction, you have an exceptionally weak case that has emerged so far. On collusion, there is an absence of evidence. There is an absence of anything connecting the president or the campaign. The last major filing said that no Trump official knowingly engaged Russians in their hacking aspect of their intervention. There could be new evidence but we haven’t heard of it. On the issue of obstruction, I think the president has what may be insurmountable defenses. You know, he can easily argue that he fired Comey for cause. Lots of people calling for him to be fired. Sean Hannity: Wait, Rod Rosenstein recommended it, too. He’d be witness number one which I think conflicts him out of the whole deal and even the appointment of Mueller. Let me ask you this. If there is no underlying crimes, professor, which you are saying and asserting there isn’t and he has the right to fire anybody and there is no crime of collusion, and why would any lawyer allow a sitting president to be questioned by a special counsel? Jonathan Turley: Well, Sean, first of all we need to be careful. Obviously we don’t know what Mueller has. There may be more crime evidence, they maybe more allegations to make but we haven’t seen them so far. And that’s quite telling. The president’s status hasn’t changed in a year. He was a subject before and he still is a subject and not a target. But as for the sit-down, it’s going to be hard for the president not to do that. The good news is Mueller is asking about four categories, where I think his defense is, the president’s defenses are the strongest. That sort of frontal attacks where the armor is the thickest. I think that he could sit down and thread that needle if he listens to his counsel and prepares for it. Sean Hannity: Why should he have to, I guess is the question? I’ll ask Mark Levin that. What about article one that literally empowers Congress for oversight purposes in the government? And I only have about 25 seconds. Doesn’t Congress — doesn’t the DOJ have to cooperate? These subpoenas went out in August 2017. Jonathan Turley: Right. I agree with you on that. I have been a long advocate of congressional oversight authority. I think Congress rolls over too readily. This has been too long. That material should have been turned over. I’m not sure why it has not. But at some point Congress has to think about using some of its inherent authority to say this is a voluntary act. You know, we are an equal branch of government.